'Sunshine on my window makes me happy, like I should be..' Sunshine is fine, I guess, but you know what really makes me happy? Eyeshadow. Especially eyeshadow palettes. If you can't get at least a little bit excited by the thought of a new palette, well, then I just don't think we could ever truly get along. Nah, we could, but I'd feel a little sad for you. 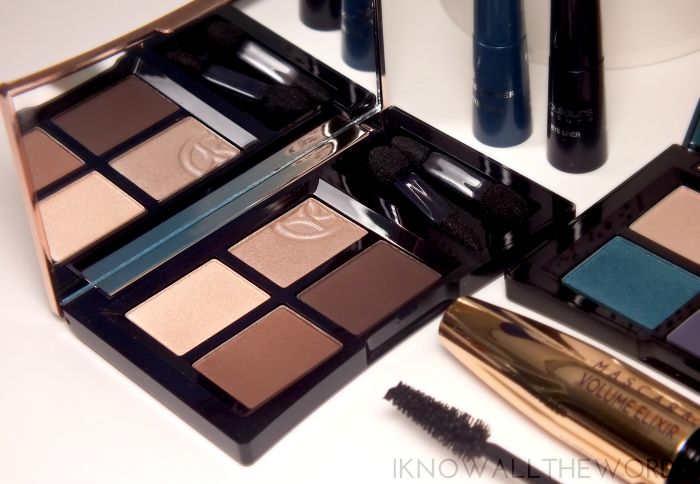 Of course there is something even better than just a palette... Two palettes, liquid liner and a mascara. Holy trinity move over. 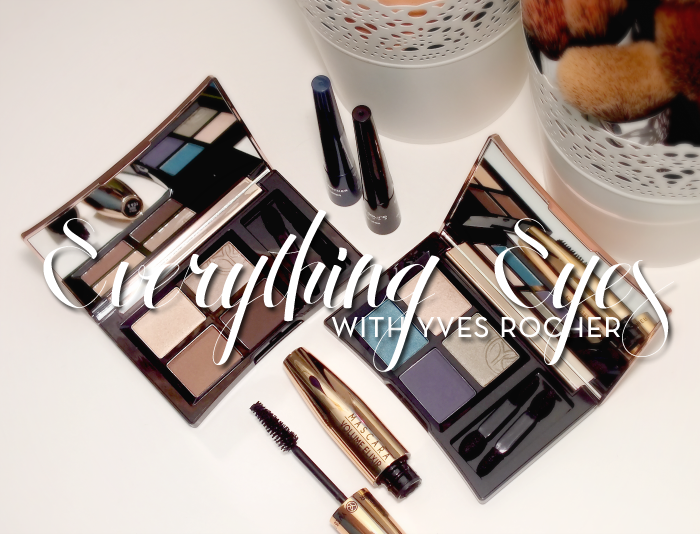 Read on for a look at a few new Yves Rocher eye products including the Yves Rocher Quad Eyshadow Suptuous Colour and Volume Elixir Mascara. Oh, and super bonus points if you know what song that quote is from! A shiny new quad... A gorgeous thing, but made even more gorgeous when it's filled with perfectly paired shades with a pretty stellar formula to match. Housed in a slim, gold compact are four shades (obvious, as it is a quad) with a full mirror and a two sponge applicators. While they're just your basic applicators, I like that they're nicely housed and out of the way. They don't fly out at you every time you open the palette and stay out of the way. You know what I mean- you have palettes where the applicators are an afterthought and are just crammed in. The small touches are always appreciated. As for the actual product, you really can't get much better than these quads. For serious. 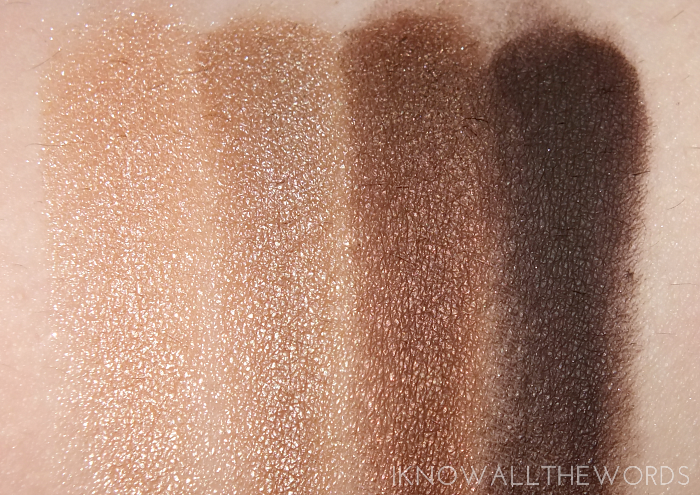 All four shades- with their various textures- are smooth, pigmented, and oh-so-blendable. The matte shade- the deepest shade in each quad- is a matte, nut not your average as it's a silky-smooth matte with incredible pigmentation. Oh, and it's plenty deep. I don't want a wimpy crease shade in a palette. I want something deep that's going to get the job done. Both the Incandescent Brown and Subtle Aquatic palettes bring the depth. The shades in the Incandescent Brown palette include a light, golden champagne, a copper meets taupe champagne, a golden chocolate brown with fine gold shimmer, and a deep, matte cocoa brown. The shades are all rather warm, so this might not be the best for those with really cool undertones, but is otherwise an excellent neutral palette. In the 'I don't know...' category is the Subtle Aquatic palette that kind of made me nervous. As much as I love blue everywhere else in my life, I still get iffy when it comes to blue shadows- particularly the aqua type shades. Well, I can now say I adore these shades! 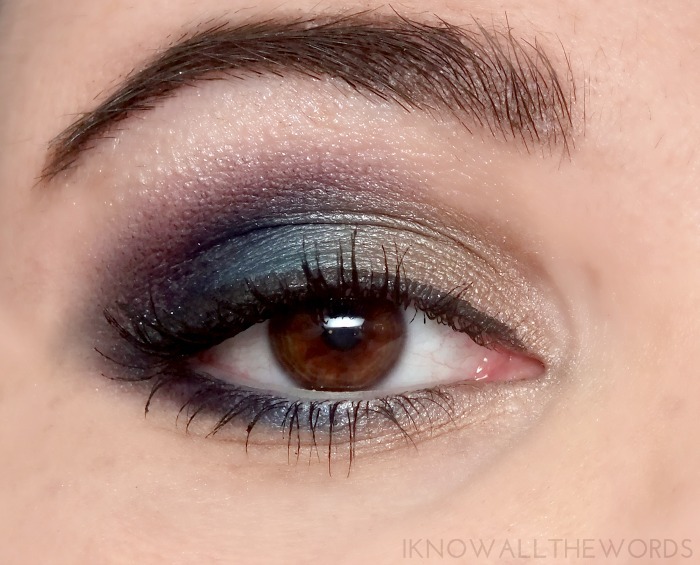 They do wonders on my dark brown eyes and come together to create a smoky, sultry eye that is colourful, but elegant at the same time. 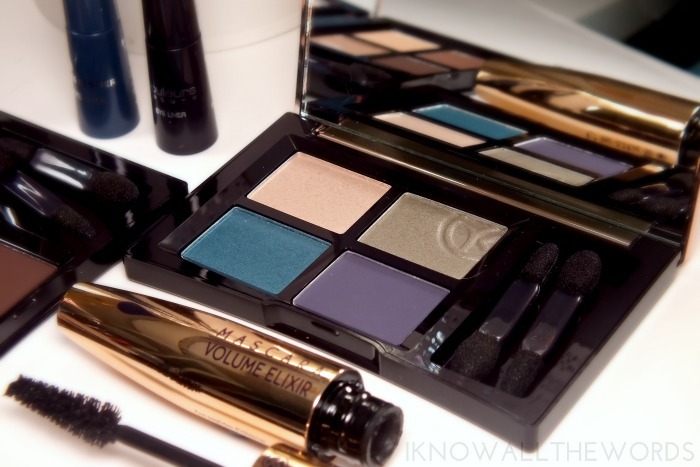 The palette includes a light golden champagne shade that is more sheer and shimmery than any of the other shades in either palette, a dirty taupe meets antique gold shade with pale golden shimmer, a vivid, yet subdued aqua blue, and a matte eggplant meets indigo. 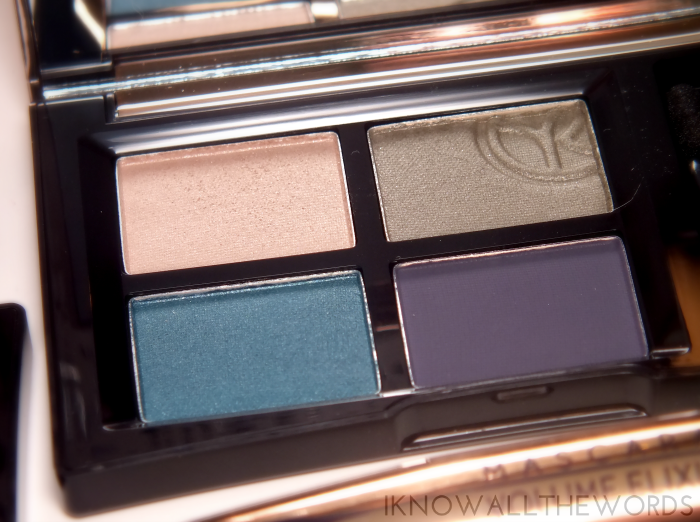 The matte shade leans both blue and purple depending on lighting and is one of the most gorgeous mattes I've ever used. It's quite intense, so I like to apply it to the crease and outer v first, blend it out and then add the other shades. Of course, what goes better with eyeshadow than a little liner? Liquid liner a that. The simply named Eyeliner is housed in a pretty basic bottle with long handle and felt tip applicator. I find the tip to be quite firm, which makes for easy lining, but I'd prefer something with a bit of movement to make getting a flick that little bit easier in one stroke. That said, the firmer tip does give more control, which is great if you're still getting used to applying the perfect line. Oh, and it dries really quickly to a nice matte finish. The formula wears really well, more like a waterproof formula than your basic as it wears beautifully ALL DAY yet is easy to remove. Best of both worlds, really. 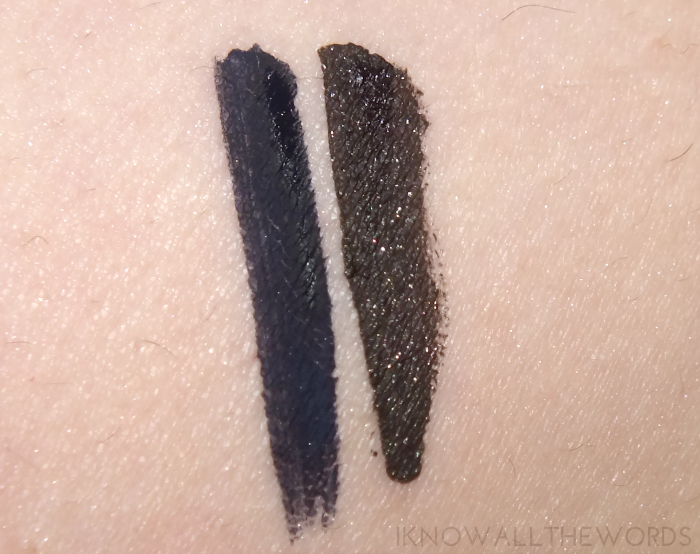 I have the shade Sapphire, a deep, inky blue, and Sparkling Black which has a matte finish with a light smattering of fine shimmer. Sparkling Black isn't a super intense black and has a softer look once dry. Normally I'm all about the blackest black, but I actually have come to like the idea of something a little softer and makes for a fast look when paired with just a bit of bold lipstick. 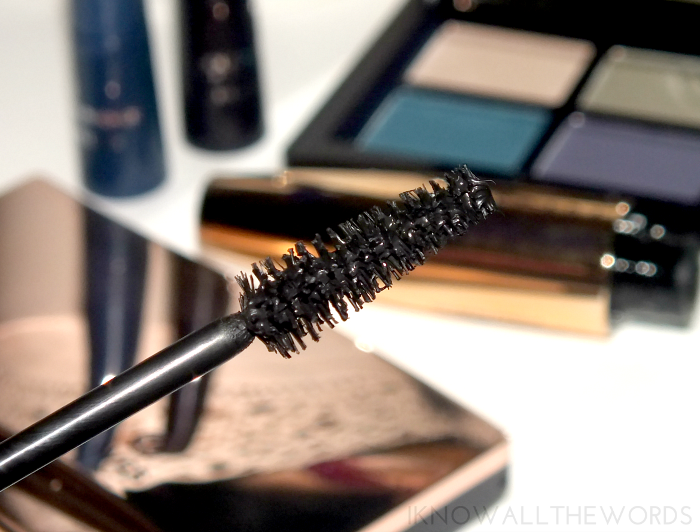 Annd, the perfect finishing touch- mascara! 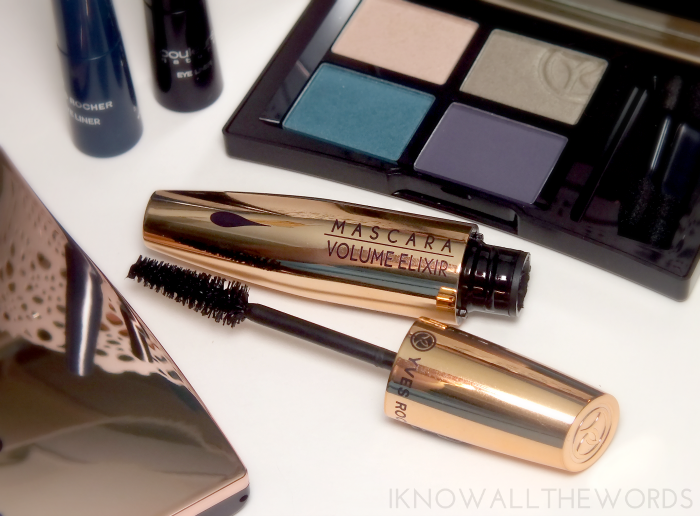 I have yet to be disappointed in any Yves Rocher mascara, and the new Volume Elixir isn't going to break that streak. Along with being formulated with a volume enhancing texture, it also includes Hibiscus peptides which are known for their nourishing properties. They work to protect lashes and reenforce lash fibers. 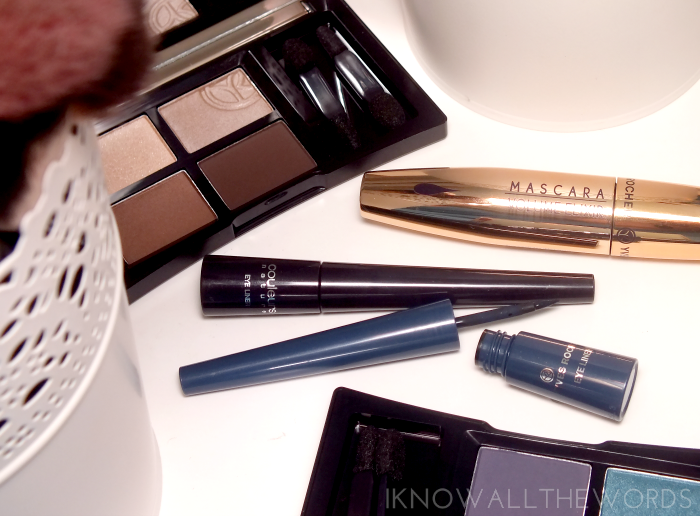 As for the mascara, it does what it claims, in the fact that it adds instant volume to lashes. It also lengthens nicely- because really, without length what's the point in volume? The formula builds nicely and doesn't get clumpy with a few coats. I find two does it for me, and I tend to have a more is more attitude when it comes to lashes. The formula is also one that doesn't drag your freshly curled lashes down and holds a curl pretty well for a non-waterproof formula. The brush, almost forgot.. The brush is almost as important as the formula. The conical shape and dual fibers work to grab every last lash and is the perfect size (ie. not massive.) I find shape works really well with my eye shape so I can cover everything quickly in a pass or two. Overall, I am quite happy with all of these products. 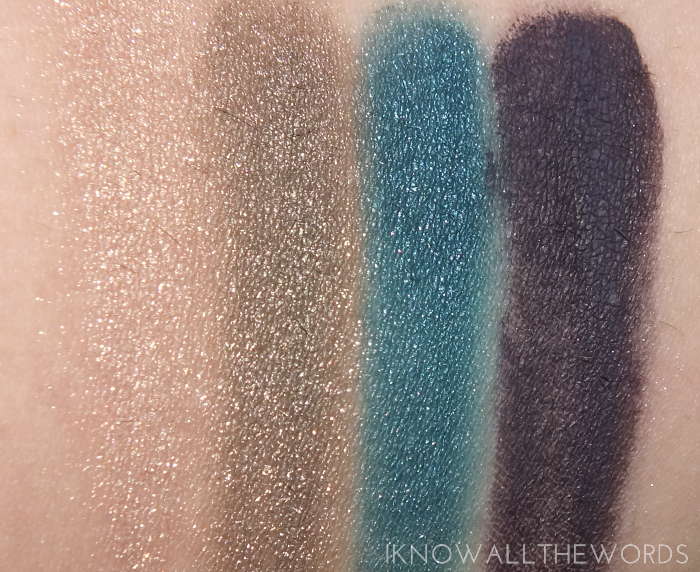 The quads though, especially Subtle Aquatic are really worth space in any makeup bag. PLUS they just happen to be 45% off right now, so, hello, perfect time to try them out. 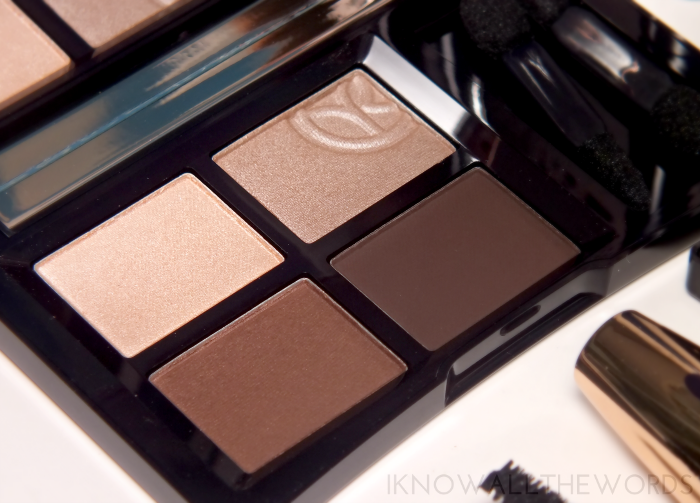 I've got a hankering for the Sophisticated Pink palette myself... Have any favourite Yves Rocher makeup items? Tried any of these? What types of shades make you nervous?